HURRICANE — Sand Hollow Resort in Hurricane is excited to host “Professor of Rock Live” with music superstar Kenny Loggins in their new outdoor venue, the Red Rock Bowl. The lawn has been laid, and organizers are thrilled to have this special event in this new venue surrounded by a stunning red rock background that they believe will become renowned across the country. “Professor of Rock Live” will be an exclusive evening of story and song, with Loggins telling the stories behind his celebrated music and sharing deeply private moments that come from an incredible career spanning more than 50 years. There are lots of opportunities available for people to see live music, said Sand Hollow Resort marketing manager Krista Wiekamp, but what sets this event apart from the rest is how intimate the venue is and how in-depth the experience is going to be. The show will take place Oct. 6 at 7 p.m. Seating is limited, and guests are encouraged to purchase their tickets early. Loggins’ remarkable five-decade-plus career has brought him from the top of the charts to the toast of the Grammys. He’s had smash hits on Hollywood’s favorite soundtracks, rocked worldwide stages and found his way into children’s hearts while bringing his soulful, beautiful voice to platinum albums of a stunning variety of genres. His gift for crafting deeply emotional music is unparalleled, and it’s been a part of his life as long as he can remember. Around a year later, inspired by the film “Yankee Doodle Dandy,” he realized songwriting was his future. Created and hosted by Adam Reader – or the “Professor of Rock” as he was dubbed by the Beach Boys – the sessions are exclusive conversations with artists about life, love, serendipity and the creative process, from their deeply personal perspectives. Professor of Rock, a full-service production house based in Salt Lake City, launched in October 2017, presenting over 500 hours of original content, including over 320 full-length artist sessions and the stories of over 400 No. 1 songs (and counting). All of the featured content on the platform is filmed and produced by Professor of Rock. October’s Professor of Rock Live show will be an intimate, once-in-a-lifetime experience, nestled in a stunning red rock backdrop on the threshold of Zion National Park. Professor of Rock is committed to the posterity of the artists and their music. It’s all about the music. 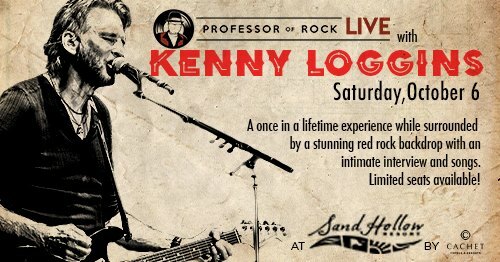 Tickets for Professor of Rock Live with Kenny Loggins are available on the Sand Hollow Resort website. There are three price packages; $249, $299 and $499 for the VIP packages. VIP packages include preferred seating, a VIP tent with beverages and small plates prepared by guest gourmet chef David Laris before the show and meet-and-greet opportunities with Loggins after the show. What: “Professor of Rock Live” with Kenny Loggins. When: Saturday, Oct. 6, at 7 p.m.
Where: The Red Rock Bowl at Sand Hollow Resort, 5662 W. Clubhouse Drive, Hurricane. Cost: $249, $299 and $499.